I Was Arrested for Possession of Marijuana in PA. What Now? Home » The Law & You » I Was Arrested for Possessing Marijuana. What Now? I Was Arrested for Possessing Marijuana. What Now? A viewer says he was arrested for possession of marijuana. But isn’t it legal in Pennsylvania? What now? Philadelphia attorneys Greg Fellerman and Ed Ciarimboli explain his legal options. Dave Kuharchik: It’s time now for “The Law & You,” and we’re talking about drug possession in today’s edition. Attorneys Greg Fellerman and Ed Ciarimboli, these guys look ready to go. Ed Ciarimboli: We’re ready. This is a great question, by the way. Great question. Ed: Not legal. It’s not legal. So, it’s legal for medicinal purposed only. And that means you need to go to a doctor. The doctor needs to prescribe the marijuana. And it’s not marijuana that you’ll be smoking, there’s creams, there’s gels, there’s pills, there’s candies. These are things that are going to be used to treat a variety of different diseases. Anxiety, depression, people who have a significant amount of pain, cancer patients. Marijuana is still not legal in Pennsylvania. The medicinal aspect of it is. But you need a prescription for it. Greg Fellerman: So, here’s what you are looking at criminally. It sounds like it was a small amount of marijuana so the good news is it would be an ungraded misdemeanor possession of marijuana, which is not a possession with an intent to deliver, which is a felony. This is personal use type issue. More likely than not, you’ll get ADR or probation, assuming on your record. So the good news is it doesn’t sound like you had a lot on you so the consequences shouldn’t be severe. Don’t do that again because it’s only going to get worse. Dave: And I know if someone out there is in a criminal situation, you guys have great referals. So how can they reach you to talk to you? Greg: Just call us, 570-714-HURT. See us on the web, 714hurt.com. If you haven’t noticed, we’ve been on social media a little bit more lately, so we’re all over social media. We’re quick on our stuff and we’ll get right to you. Dave: I like the beaming picture of Greg Fellerman. He’s like he’s got a halo around him. 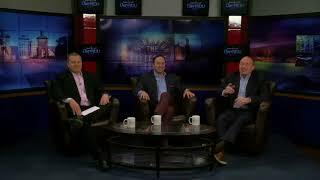 Dave: Results matter with attorneys Greg Fellerman and Ed Ciarimboli. We’ll see you next time, guys.